In the constellation of singular spring flowers, there are a few stars that shine more brightly than the rest. Perhaps the fairest of them all is the great white trillium, Trillium grandiflorum, a woodland wildflower beloved by conservationists, gardeners, schoolchildren, and white-tailed deer. Also known as white wake-robin, snow trillium, trinity flower, or large-flowered trillium, it is easily recognizable by its waxy white flower with three petals and three sepals, blooming atop a single stalk arising from a whorl of three deep green leaves. As the plant ages, the white, wavy-edged flowers will often fade to pale rose. 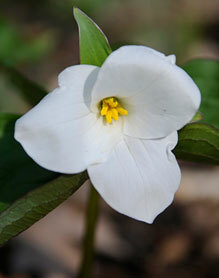 A member of the lily family and native to eastern, southeastern, and midwestern states, trillium grows happily in heavily composted, partially shaded woodlands in the company of a community of interdependent woody shrubs, tall trees, dried leaves, and other soil components, insects, bacteria, and fungi. In the Chicago area, where spring weather and associated bloom times are unpredictable, it usually flowers between April and early June. Companion wildflowers include mayapples, Dutchman’s breeches, wood and rue anemones, Jack-in-the-pulpits, shooting stars, and many other tiny treasures of the woods. Trillium grows from an underground rhizome or root stalk, and will slowly form a spreading colony if allowed to grow in peace. Deer and marauding “gardeners” who dig where they shouldn’t are the plant’s primary threats. The deer seem to favor the larger plants and will swipe all the greenery from the root stalk, effectively killing the plant, since the rhizome is left with no means to produce food/energy for future growth. While native Americans enjoyed the greens as a vegetable or chewed the leaves for a variety of medicinal purposes, ranging from rheumatism, menstrual cramps, and earaches, we should not. Trillium grandiflorum is a classic native spring ephemeral, a wildflower that brings joy to all who witness its reliable return before it naturally dies back to the ground by August. You can catch its show in McDonald Woods, the Sensory Garden, the Native Plant Garden, and Lakeside Gardens.